Measuring for your our custom blinds & shades is easy! We've put together some helpful measuring guides to help you on your way. Still unsure? Contact a member of the Blindsmax family for help. Always use a steel tape measure. 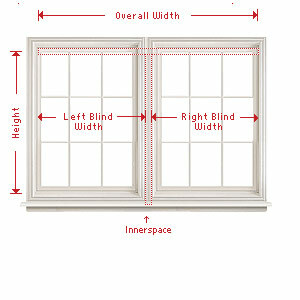 Measure each window you plan to cover. Windows of different sizes can appear deceptively similar. Round to the nearest 1/8 of an inch. Make sure you clearly indicate width from the height. It's very easy to accidentally transpose these measurements. We have professionals waiting to help you with measuring and installation. 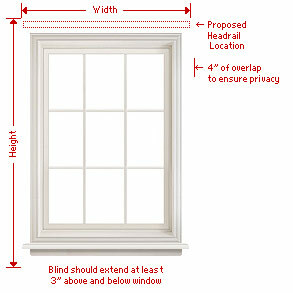 IMPORTANT: For inside mounted blinds, measure the actual window opening size. Please do not make deductions. Our factory will take all necessary allowances to ensure proper fitting. 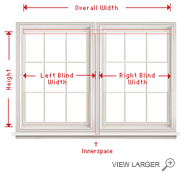 STEP 1 - Find the width: Measure the exact width your window in 3 places – across the top, across the middle, and across the bottom. Record the measurements rounding down to the nearest 1/8".Use the narrowest of the three measurements when ordering the width. Do not make any additional width deductions – the factory will make the appropriate deductions. STEP 2 - Find the height: Measure exact distance rounding up to the nearest 1/8" from inside surface at top of window to the window sill at the left, middle, and right. Use the longest measurement when ordering the height. TIP: For optimal light control, allow the blind to overlap 1 1/2" – 3" on the sides, top, and bottom of the window. You'll need to add this to your measurements. STEP 2 - Find the height: Measure exact distance to the nearest 1/8" from where top of blind will be located to the top of the window sill. If there is no sill, or if blind is to overlap the window frame, measure to the point where the blind is to reach. IMPORTANT: For inside mounts, measure the actual window opening size. Please do not make deductions. Our factory will take all necessary allowances to ensure proper fitting. 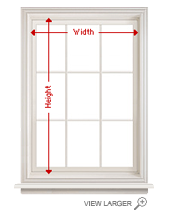 STEP 1 - Find the width: Measure exact distance to the nearest 1/8" between the inside surfaces of window frame at the top, middle, and bottom. Use the narrowest measurement when ordering the width. Do not make any additional width deductions – the factory will make the appropriate deductions. STEP 2 - Find the height: Measure exact distance to the nearest 1/8" from inside surface at top of window to the window sill at the left, middle, and right. Use the longest measurement when ordering the height. If you prefer blind not to touch sill, deduct 1/4". If there is no sill, measure to the point where blind is to reach. 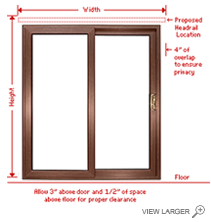 TIP: For outside mount applications allow the blind to overlap 1 1/2" – 3" on the sides, top, and bottom of the window. You'll need to add this to your measurements. 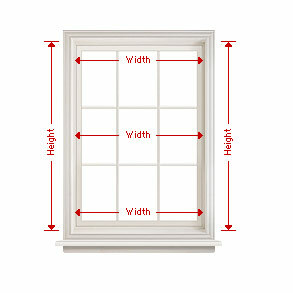 STEP 1: Find the width: Measure exact distance to the nearest 1/8" between the inside surfaces of window frame at the top, middle, and bottom. Use the narrowest width. STEP 2: Find the height: Measure exact distance to the nearest 1/8" from inside surface at top of window to the window sill at the left, middle, and right. Use the longest height. If you prefer blind not to touch sill, deduct 1/4". If there is no sill, measure to the point where blind is to reach. 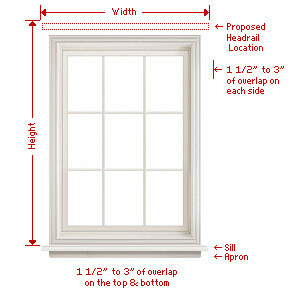 STEP 2: Measure exact distance to the nearest 1/8" from where top of blind will be located to the top of the window sill. If there is no sill, or if blind is to overlap the window frame, measure to the point where the blind is to reach. 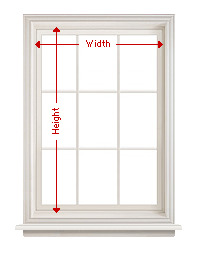 STEP 1 - Find the width: Measure the opening across the top, where the headrail is to be installed, from inside of window frame on left to inside of window frame on right. Round the measurement down to the nearest 1/8". 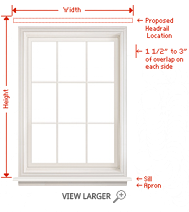 A minimum depth of 2 1/2" is needed to install inside the window. STEP 2 - Find the height: Measure from the inside top of the opening on the left, at the center, and on the right to the sill; to the closest 1/8". Use the smallest dimension. STEP 1 - Find the width: Measure the width of the area to be covered at the place where the headrail will be installed to the nearest 1/8". Blind should overlap opening at least 4" on each side to ensure privacy. To maintain the maximum view, allow adequate overlap and consider the stack width. STEP 2 - Find the height: Measure the height of the area to be covered round down to the nearest 1/8". 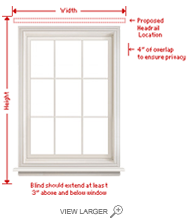 Blind should extend at least 3" above and 3" below opening or window moulding. NOTE 1: For installations to the floor, deduct 1/2" from the shortest height for proper clearance. NOTE 2: Specifying outside mount measurement means the factory makes allowances for headrail deductions only. STEP 1 - Find the width: Measure the width of the area to be covered at the place where the headrail will be installed to the nearest 1/8". Blind should overlap opening at least 4" on each side to ensure privacy. STEP 2 - Find the height: Measure the height of the area to be covered at the left, center and right and round down to the nearest 1/8". Blind should extend at least 3" above opening or window moulding. NOTE 1: To ensure easy access through the door and allow adequate overlap, consider the stack width. NOTE 2: For installations to the floor, deduct 1/2" from the shortest height for proper clearance. NOTE 3: Specifying outside mount measurement means the factory makes allowances for headrail deductions only. STEP 1 - Find overall width: Measure exact distance between inside surfaces of window frame at the top, middle, and bottom, and take note the narrowest width. You'll need to confirm this number in your Order Summary. STEP 2 - Find the width of the left blind / shade: Measure the width that you want the left shade to cover. Order this shade first when placing your order. STEP 3 - Find the width of the right blind / shade: Measure the width that you want the right shade to cover. STEP 4 - Find the height: Measure exact distance from inside surface at top of window to sill. If you prefer shade not to touch sill, deduct 1/4". If there is no sill, measure height to point where shade is to reach. NOTE 1:There will be a 1/4" innerspace between the fabric on the left and right shade to allow for shades to operate independently. This standard innerspace can be increased if customer requests; the minimum is 1/4" and the maximum is 2 1/2". NOTE 2:The left shade width plus the innerspace, plus the right shade width must equal the overall shade width. STEP 1: Measure the desired width. For maximum privacy and window coverage, add an additional 3" to total width of window. STEP 2: Measure the width that you want the left shade to cover. STEP 3: Measure the width that you want the right shade to cover. The left shade width, plus the right shade width must equal the overall shade width. 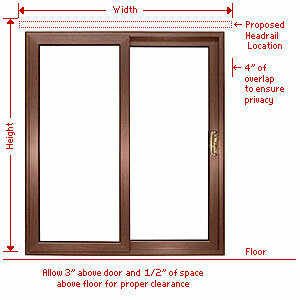 STEP 4: Measure the window from the top to the bottom for the desired height. For maximum privacy and window coverage, add at least 3" to overall height of the window.